File photo of Left Front gathering. 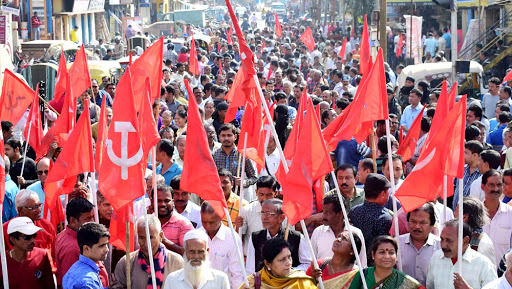 Kolkata, March 19: With Congress announcing to go solo in the state of West Bengal for the upcoming Lok Sabha Elections 2019, it left the Left Front in that state miffed. Now the Left Front Committee has released a final list to field 38 candidates for the polls, instead of 25, which it released some days ago. Also, surprisingly, four seats – Maldala Uttar, Maldaha Dakshin, Jangirpur and Baharampur. As per the latest list released by the Left Front, new candidates have been announced from – Darjeeling (Saman Pathak), Krishnanagar (Dr Shantanu Jha), Barrackpur (Gargi Chatterjee), Dum Dum (Nepaldeb Bhattacharya), Mathurapur (Dr Sharat Haldar), Kolkata Uttar (Kaninika Bose), Howrah (Sumitra Adhikary), Sreerampur (Tirthankar Roy), Ghatal (Tapan Ganguly), Talmuk (SK Ibrahim Ali), Kanthi (Paritosh Pattanayak), Jhargram (Deblina Hembram), Bankura (Amiya Patra), Birbhum (Dr Rezaul Karim), Bolpur (Dr Ramchandra Dome) and Asansol (Gouranga Chatterjee). Lok Sabha Elections 2019: Left Front Committee Releases First List of 25 Candidates for West Bengal. As per the Election Commission’s announcement on March 10, there would be seven phases of polls in the state, with ample security deployed to ensure peaceful elections. The polls would be conducted on April’s 11, 18, 23, 29 and May’s 6, 12, 19 in the state. The results of the Lok Sabha elections would be announced on May 23.